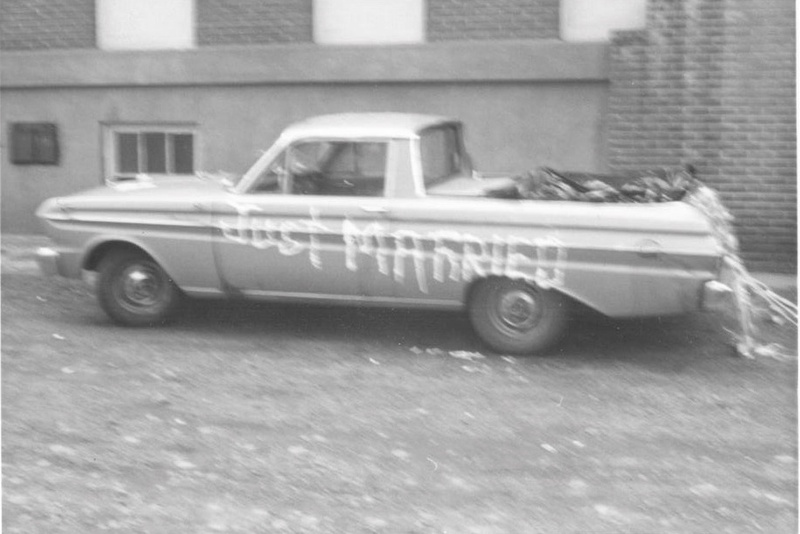 The Ranchero saga began in the fall of 1964 when Grandpa Harry drove it from the Teague Motor Sales showroom. It had white-wall tires, “Honey Gold” exterior, a 3-speed Cruise-O-Matic transmission and was powered by a 200-cubic inch straight six. How well I remember Grandpa chuckling with glee when he stomped on the gas pedal and was rewarded with a burst of speed. His ability to find entertainment at other people’s expense was a behavior I grew to appreciate. But inevitably, as with racehorses and hunting dogs, old age caught up with Grandpa. California stops, back-ups without looking and T-boning a station wagon on the way to the bowling alley served notice that every-day driving had become a challenge for him. At age 72, with his last vestige of freedom no longer in the cards, we took away the keys. 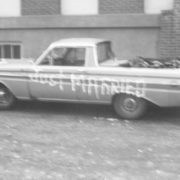 Rather than park his beloved Ranchero in his hay barn for pigeons to crap on, he offered it to my parents who were badly in need of a second vehicle to alleviate the crunch of seven family members competing for the use of an aged Plymouth sedan. The Ranchero reported for duty in the spring of 1967 with 11,000 miles on its odometer and vinyl seats that smelled factory new. “Ronnie the Ranchero,” as we nicknamed it, proved to be a workhorse for our family. Over the next few years, my siblings and I drove it back-and-forth to college in the Willamette valley and to summer jobs. In the summer of 1970, Lee Trevino won the 100th British Open, George Harrison played the sitar at Bangladesh and Apollo 15 circled the earth. I was 19 years old. That summer was also the last time that Grandpa Harry and I fished together. On the morning of that last fishing trip, I punched the exit clock after working a night shift at the local pea cannery and stepped from its cool concrete shell into the bright light of day. Blue skies greeted. The Ranchero’s bronze hood gleamed and its fine-tuned motor responded like a trustworthy steed when I turned the ignition key. A restless sense of anticipation followed the rush of stored-up adrenaline. Who needs sleep before your night off? I thought. Driving directly to my grandparent’s place, I approached the south pasture where winnows of fresh cut alfalfa emitted mildewed pungency. A flock of gray geese worked over orchard grass lining the barnyard’s rail fence. Bees circled lazily around a row of supers stacked three-high beside the small spring-fed pond that held Grandpa’s pet trout. My grandparent’s brick-faced ranch-style home was fronted with two majestic weeping birch and a curved concrete driveway framed by boxwood shrubs. It was twenty minutes short of 8 a.m. when I nosed the Ranchero into a parking spot. Grandpa’s creel, brown cotton vest, and two-piece bamboo fly rod with striped cloth case lay in a neat pile by the garage door. The metal “Farmers Exchange” thermometer tacked to the side of the house read 75 F.
I loaded Grandpa’s fishing gear and we headed south towards the Blue Mountain foothills. Our direction of travel took us past colonial-style farmhouses, Graybill’s swimming pool and goat pastures overgrown with teasel and bull thistle. We discussed the price of wheat and marveled at dust devils whirling like spinning tops over furrowed fields. Unwritten rules of the road were to watch for farm trucks on blind curves, drive 50 mph on straight-aways and leave a dust plume for the next vehicle to eat. Grandpa was at his storytelling best on that trip, the last one we fished together. Leaning across the front seat, he spun tales about ornery mules, horseback rides to headwater trout, his latest bowling score and past life at the Ganders & Winget bicycle store. We were like two peas in a pod. What I remember most about that drive to the South Fork of the Walla Walla River was how good I felt. Grandpa’s ability to make you feel special went beyond the way he told a story. His ever-present smile, sparkling eyes and boyish vulnerability drew you near. His genuine concern for your feelings provided comfort when things weren’t going your way. Those attributes I hoped to someday emulate. Our day’s fishing began at Elbow Creek, where the path of the river twists sharply to the north. Grandpa stayed close to the trail while I hiked upstream. When we met up at noon, I found him working a boulder-laden stretch shaded by overhanging alder, battered willow creel strapped to his side. Using a full shoulder throw to deliver a Royal Coachman Bucktail to a deep run on the opposite bank, he lowered his rod tip and mended line to float his offering at the speed of the current. Grandpa’s technique suggested form and function. “10 o’clock, 1 o’clock,” he coached when my casting technique collapsed at the point of release. I can’t tell you how many trout we caught that day or how big they were, only that we had a great time. When the next summer rolled around, I was a newlywed. Nancy and I had been virtually inseparable since we first met in college. “Can’t keep their hands off each other,” Dad often remarked. When heated discussions cooled, Mom and Dad signed the legal paperwork to grant me “underage” permission to get married. It helped that Nancy’s folks were more than eager to pair her up. We migrated to summer jobs on the Oregon coast where I worked for the Game Commission as a fish checker and Nancy waitressed in a seafood restaurant. Five months later, we returned home to announce that Nancy was pregnant. The downside was that Grandpa Harry didn’t live long enough to share in the excitement of his first great-grandchild. Frank Soos wrote, “Death cannot be reconciled despite a wash of words.” Neither did we find comfort in tired huddles. The sun did not shine for me that day and victuals lacked flavor. I remember numb limbs, the salty sweet taste of tears and a sleep-deprived brain screaming, “It’s not possible!” But Grandpa Harry was gone. He would no longer greet me at his front door with a strong handshake and a ready smile. 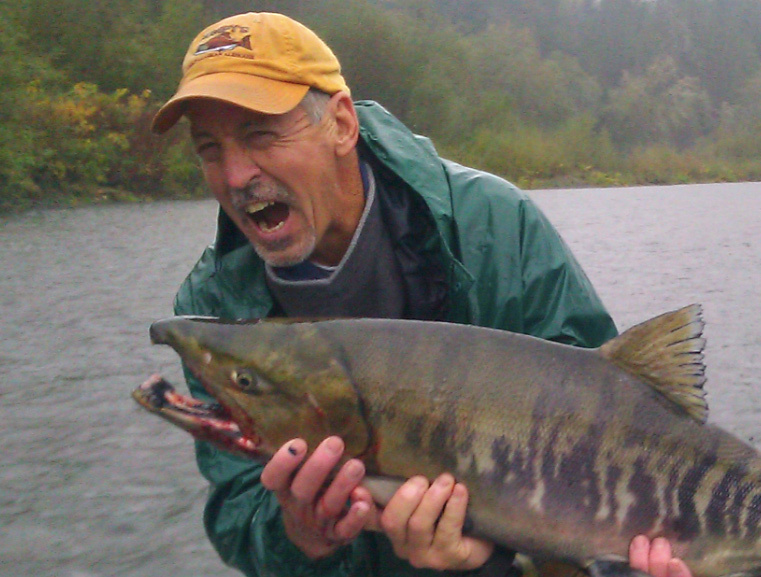 There would be no more fishing the South Fork together. Until the day that Grandpa Harry passed away, my life had been sheltered from tragedy. Getting skunked while fishing or losing the big one at the net did not enter into the equation. You could say I was naïve about life’s possibilities. Back then pregnant girls and delinquent boys were sent away until cured. Nobody’s dog got euthanized. They were “put to sleep” or they “ran off.” All husbands and wives loved each other, priests were one step from sainthood and baseball stars were unsullied American heroes. Growing up in a small town can do that to you. The number of experiences and people you encounter limit your understanding of the world. Because of that harsh dose of reality, I did not attend Grandpa Harry’s viewing. I wanted to hold onto the image of our last day on the South Fork: his forward lean as he cast to the far bank; cold, clear water swirling around his knees; a bemused smile when a fat trout jumps at the sting of his hook. I can still picture the slice of his fly line in fast current and the deep bow in his trusty bamboo rod when the fish pulls hard. In my memory, Grandpa lands the largest trout of the day (easily 16 inches long) and releases it so that others have opportunity to do the same. In 1999, I reluctantly put the Ranchero up for sale. The challenge was how to let go of my heartfelt memories. Those carefree summer days tooling down the Oregon Coast, smiling bride by my side. The morning I brought my newborn daughter home from the general hospital. Teaching my son how to drive on weekend trips to the city dump. And what about that last sunny afternoon on the South Fork, sitting on the tailgate with Grandpa Harry, him trying to coax me into taking a bite of stinky limburger cheese? Five months after my first newspaper ad, the Ranchero’s one working brake light flashed goodbye as it turned the corner, its new owner at the wheel. More than three decades of family memories had been reduced to eighteen Ben Franklins. Regardless of its novelty, the fat wad of cash in my wallet felt inadequate. I crouched at the curb and traced the outline of crankcase oil, transmission fluid and engine coolant that soaked into asphalt. No matter how hard I tried to evoke magic, there was no flood of memory, no relief, no sadness. Like a death-row prisoner resigned to his fate, I had let go. It was the end of an era but you can’t purchase tradition.